Editor’s note: Contributor Kai Lukoff is a Beijing-based writer who is the founder of startup blog Techrice. In the West, the battle for the social graph is over for now. Facebook is the undisputed champion. All my Western friends use Facebook, and many are addicted. “If Facebook is the world’s social graph, then QQ (Tencent’s instant messenger) is China’s social graph,” says Hong Bo (a.k.a Keso), China’s most famous tech blogger. In China, Tencent is the longstanding champ, but its title is being disputed by Sina, one of China’s earliest portal sites. Sina Weibo is the biggest story in the Chinese Internet over the past year, reaching 250 million registered users, and about 25 million daily active users as of Q3 2011. The coverage of China’s state-directed media leaves a lot to be desired, so Sina Weibo had become a prime source for breaking news events and commentary. It’s also a prime source of celebrity sightings and cultural memes—actress Yao Chen has more than 15 million followers. And instead of exchanging name cards at dinner, it’s now common practice to instead exchange “follows” on Sina Weibo. Among white-collar workers, Sina Weibo is far more widespread than Twitter is in America. Sina Weibo filled a vacuum in social networking among China’s white-collar users. In fact, Weibo (which means microblog in Chinese) evolved out of a project to build a Facebook-style social network called Pengyou, which CEO Charles Chao axed in favor of building the Weibo microblog [see TC Cribs visit Sina HQ]. Sina employees refer to Weibo as “FaceTwitter”, revealing their ambitions for the product to be more than just social media, but also a social network. Tencent, unlike Facebook, is not the same fighter across all weight classes. In 3rd and 4th tier cities and rural areas, Tencent is dominant. But in top-tier cities, among white-collar users, the Tencent brand is not cool. Virtually all Chinese do have a QQ account, and many still use it to communicate with old friends, but it’s slightly embarrassing—not an ID to give out to your slick new ‘city friends’. Tencent’s weakness is Sina’s opening. Unfortunately for Sina, growth appears to be decelerating. There’s concern that usage may even be declining due to government efforts to tame edgy content, including rumors of a real-name registration requirement. Eric Wen of Mirae Asset writes that Sina Weibo is now in a “trough of disillusionment”, citing iResearch data showing that the user base, time spent and visitation time have declined for two consecutive months. Tencent, for its part, long ago responded with its own “me-too” microblog, to prevent its user base from defecting to Sina Weibo. Its Tencent Weibo now claims 300 million users, although user activity pales in comparison to Sina Weibo. iResearch’s iUserTracker finds upwards of 80% of Chinese microblog user activity takes place on Sina. Tencent Weibo does not need to stand on its own. In US terms, Tencent’s social hub is as if AIM, MySpace, Twitter, and a mini Facebook were owned by one company, and all cross-promoted and synced to each other. 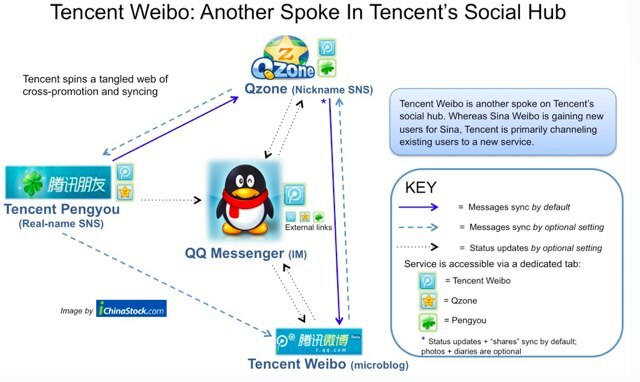 Tencent has locked-in a huge user base via the social graph of QQ Messenger, and Tencent Weibo is just another spoke in that hub. Tencent is also on the attack deep into “Sina territory”, making inroads among smartphone users, an elite demographic that has traditionally eluded Tencent. Its Weixin app aims to become the QQ IM of mobile, China’s social layer in mobile and a hub for all of Tencent’s other mobile services. Weixin is growing explosively, reaching 20 million active users and 50 million registered, among a total of 70-80 million Chinese smartphone users. Sina is scrambling for a response, and just released a Weiyou messaging application for Android. There are other social networks in China, but none present a serious threat to Tencent’s control of the social graph. The real-name social network Renren has 38 million monthly active users, but has struggled to break out of the student demographic. Kaixin001, Douban, and 51.com serve niche communities. Facebook and Twitter remain blocked out by the Great Firewall. Sina Weibo is a tremendous product that should maintain its audience of white-collars and influence in Chinese media. But it’s tough to knock out the champ. Tencent knows when to defend (Tencent Weibo), and is still nimble and creative enough to attack (Weixin). Its social graph is over ten years in the making and shows no signs of letting up now.